I found this recipe at MyRecipe.com. 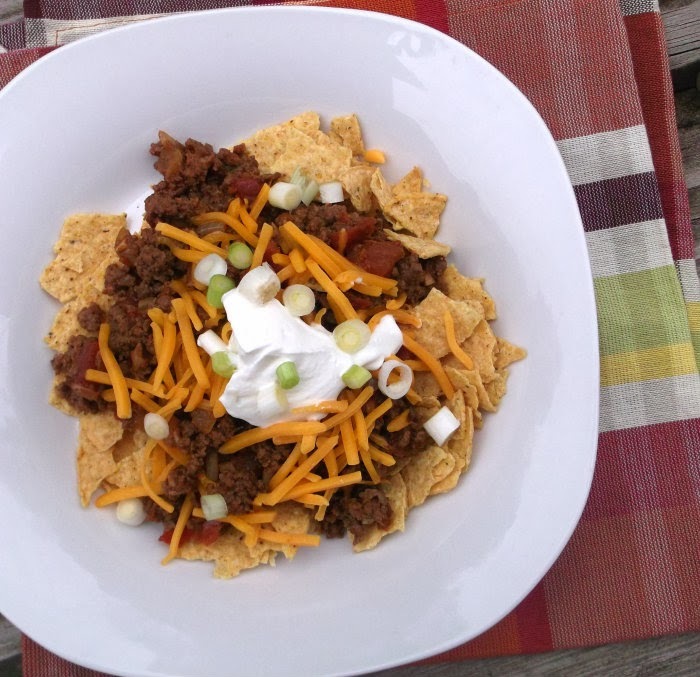 The description of the recipe mentioned that it was a healthier version of a Fritos chili pie that are served at concession stands at places such as sporting events. Where I come from we call them “walking tacos”, but we use a taco flavored meat rather than a chili flavor mixture. 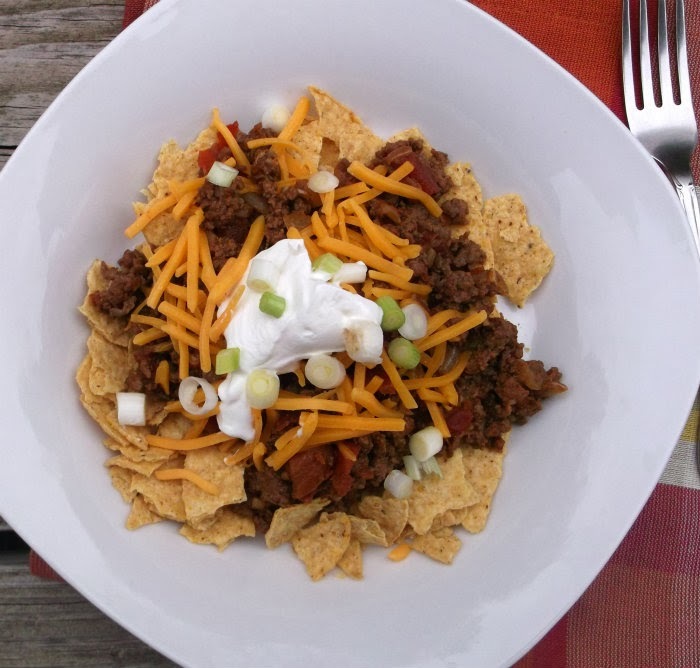 Walking tacos were big food items at the concession stands when our kids were younger and were in sports. It didn’t matter what school you went to walking tacos were being served. Even our church fall festival got on the band wagon and sold them as one of their food items. A walking taco is simply a bag of some sort of corn chips that is opened and taco meat and taco fixings are added to the bag. You eat the concoction right out of the bag with a fork. I have eaten a few of these walking tacos and they are not only yummy, but they are fun too. This version is equally as tasty, just minus the bag. Heat a large skillet over medium-high heat. Add the ground beef; saute for 5 minutes, stirring to crumble. Remove ground beef and drain pan, wipe out any excess grease with paper towel. Add the onion to pan; saute 4 minutes, stirring occasionally. Add the garlic; saute 1 minute, stirring constantly, Stir in ground beef, cumin, red pepper, and salt. 2. Stir in tomato paste; cook 1 minute, stirring occasionally. Add the water and the can of diced tomatoes and chilis bring to a boil, reduce the heat to simmer and heat for 10 to 15 minutes stirring occasionally. Remove from heat. 3. 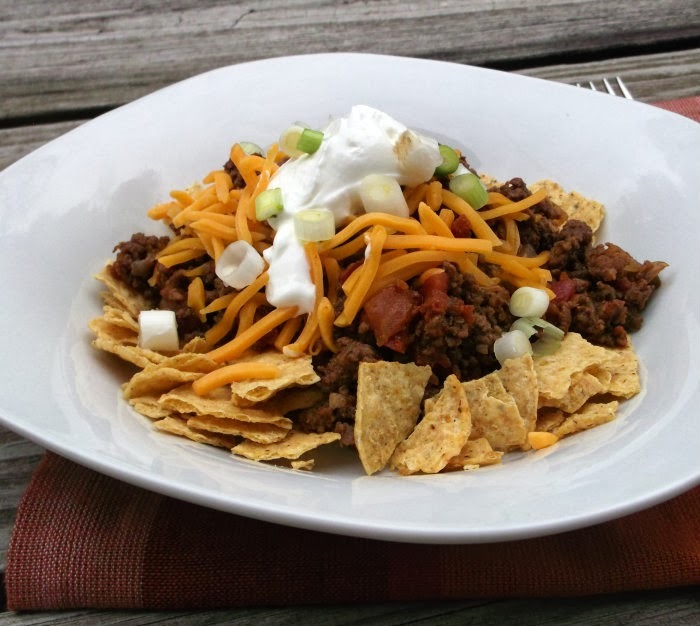 Place chips in bowl or plate top with ground beef, cheddar cheese, sour cream, and green onions. If you prefer you can top with your favorite taco toppings. I’ve never heard of a walking taco! Now I feel like i kind of missed out. Sounds like a great frito pie alternative! Never heard of a “walking taco”, but I would serve this for lunch or for dinner. My family would love it. It looks like my kind of meal. Quick, easy, and delicious. This does look good! I don’t know how anyone could stop eating it…is that a problem? : ) And now I’ve learned about walking tacos – thank you! I love anything “taco” so I know this dish would be a hit! This is a dish from my childhood! My best friends mom made this…and I was lucky enough to eat it at their house a few times! I must try it at home!!! I love Frito Pie! Never heard the name Walking Tacos before – I think I like that better. Anyway, this is classic good stuff – thanks so much.